Imagine a rocket car that can scream across the Earth's surface at 1,000 mph. 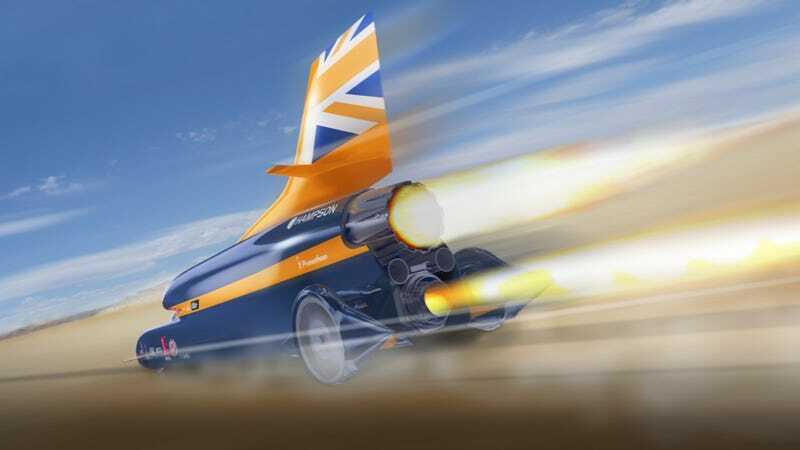 It will take nothing short of a rocket motor, a Formula 1 engine, and technology used on the U.K.'s old nuclear cruise missiles to get the car up to that speed, but Falcon Project, Ltd. appears ready to enter the engine testing phase for the Bloodhound Supersonic Car. Step one in turning the comic book super car drawings of Bloodhound SSC into a real, live, 1,000 mph rocket car is to test the rocket engine. To do that, the Bloodhound SSC team will bolt the 12-foot-long, 18-inch diameter rocket engine to a stand and blast away at an airfield in Newquay, in England's remote southwest corner. The engine's specs say that it can produce 12,000 pounds force of thrust. To power the rocket, the design team will use an F1 Cosworth V8 engine to drive a high output pump — of the type once used in Her Majesty's cruise missiles. The pump will blast a liquid oxidizer into the rocket's chamber, where it will mix with a solid fuel. Let's go over that one more time: F1 engine squirts liquid oxidizer into solid rocket fuel, blowing flames out of a small chamber and creating 12,000 pounds force of thrust. Oy vey! Researchers expect the rocket engine to gulp down more than a ton of liquid oxidizer during the test burn, which, according to their calculations, should produce somewhere between 20,000 and 30,000 hp. If the engine works as planned, they hope it will propel the rocket car to 850 mph — breaking the current land speed record — in 2013 and 1,000 mph by 2014 on a lonely plain in South Africa.